The reverse lock seal less joint features reversed interlocking keys for added security in impact conditions. 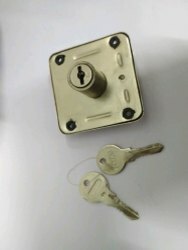 Our organization is offering Doom Lock to our clients. To meet the distinguished requirements of the customers, we provide these locks in varied sizes and specifications. Before the end delivery, a team of quality examiners stringently checks these locks on certain industry laid parameters to ensure their flawlessness. These Key Locks are known for their ability to do heavy duty and precise design. We are engaged in providing a top quality of Steering Key Lock to our valuable clients. This product is made by using best quality material and advanced tools. Capitalizing on the ability of our skilled crew, we are keenly indulged in providing Regular Key Lock. Contact & Voltage Rating: 0.5 A, 250V AC . We manufacture Key Lock E Type for Railway Signalling Item.